Basket Analysis is a very common analysis especially for online shops. Most online shops make use of it to make you buy products that “Others also bought …”. Whenever you view a specific product “Product A” from the online shop, basket analysis allows the shop to show you further products that other customers bought together with “Product A”. Its basically like taking a look into other customers shopping baskets. In this blog post I will show how this can be done using Power Pivot. Alberto Ferrari already blogged about it here some time ago and showed a solution for Power Pivot v1. There is also dedicated chapter in the whitepaper The Many-to-Many Revolution 2.0 which deals with Basket Analysis, already in Power Pivot v2. Power Pivot v2 already made the formula much more readable and also much faster in terms of performance. Though, there are still some things that I would like to add. First of all we do not want to modify this model but just extend it so that all previously created measures, calculations and, most important, the reports still work. So the only thing we do is to add our Product-tables again but with a different name. 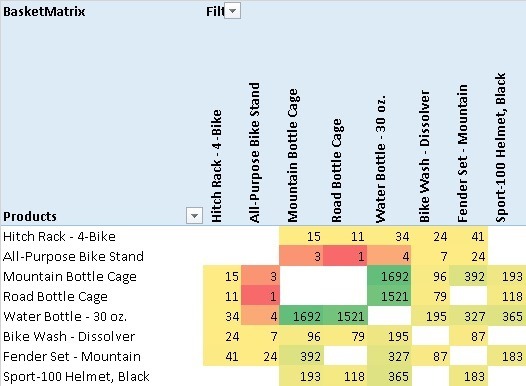 Note that I also added the Subcategory and Category tables in order to allow Basket Analysis also by the Product-Category hierarchy. As we further do not want to break anything we only use an inactive relationship to our ‘Internet Sales’ fact table. The inner CALCULATETABLE returns a list/table of all [Sales Order Numbers] where a ‘Filtered Product’ was sold and uses this table to extend the filter on the ‘Internet Sales’ table. It is also important to use ALL(‘Product’) here otherwise we would have two filters on the same column ([ProductKey]) which would always result in an empty table. Doing a COUNTROWS finally returns all for all baskets where the filtered product was sold. We could also change ‘Internet Sales'[Sales Order Number] to ‘Internet Sales'[CustomerKey] in order to analyze what other customers bought also in different baskets (This was done for Example 3). The whole SUMMARIZE-function could also be replaced by VALUES(‘Internet Sales'[Sales Order Number]). I used SUMMARIZE here as I had better experiences with it in terms of performance in the past, though, this may depend on your data. The calculation itself also works with all kind of columns and hierarchies, regardless whether its from table ‘Product’, ‘Filtered Product’, or any other table! So what can we finally do with this neat formula? As we can see people that buy black bikes are more likely to buy red helmets than blue helmets. Water Bottles are very often sold together with Bottle Cages – well, not really a surprise. Again, you can also use all kind of hierarchies here for your analysis. The big blank section in the middle are our Bikes. This tells us that there is no customer that bought two bikes in the same order/basket. Aaron Phillips has bought a Water Bottle but no Mountain Bottle Cage nor a Road Bottle Cage – maybe we should send him some advertisement material on Bottle Cages? As you can see there are a lot of analyses possible on top of that little measure that we created originally. All work with any kind of grouping or hierarchy that you may have and no change to your data model is necessary, just a little extension. And that’s it – Basket Analysis made easy using Power Pivot and DAX! 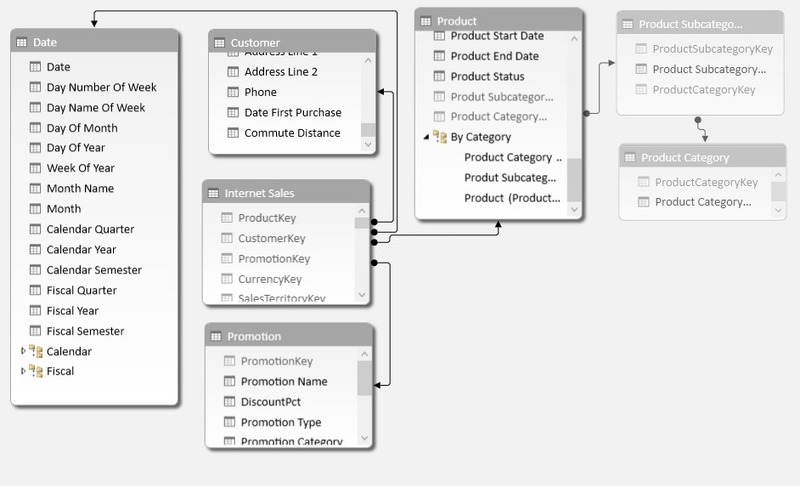 This entry was posted in DAX, Excel, PowerPivot, Statistics, Tabular and tagged Basket Analysis, Cross Selling, Customer Analysis, Product Analysis by Gerhard Brueckl. Bookmark the permalink. This is very cool and pretty simple to implement. Thanks so much for posting it! I am buyer for a home improvement retailer in Canada. This technique has given me great insights and a wonderful opportunity to design a cross merchansiding plan for my products throughout the store. I can’t thank you enough for sharing your wisdom. Glad to hear it helped you guys! Thank you for this excellent breakdown of DAX and many-to-many relationships! performance usually depends on the number of e.g. products that you have – how many products do you have? It is running very slowly in the classic analysis version. Formula is exactly the same. After watching one of Rob’s videos on performance, I think that the issues may be related to slicers. 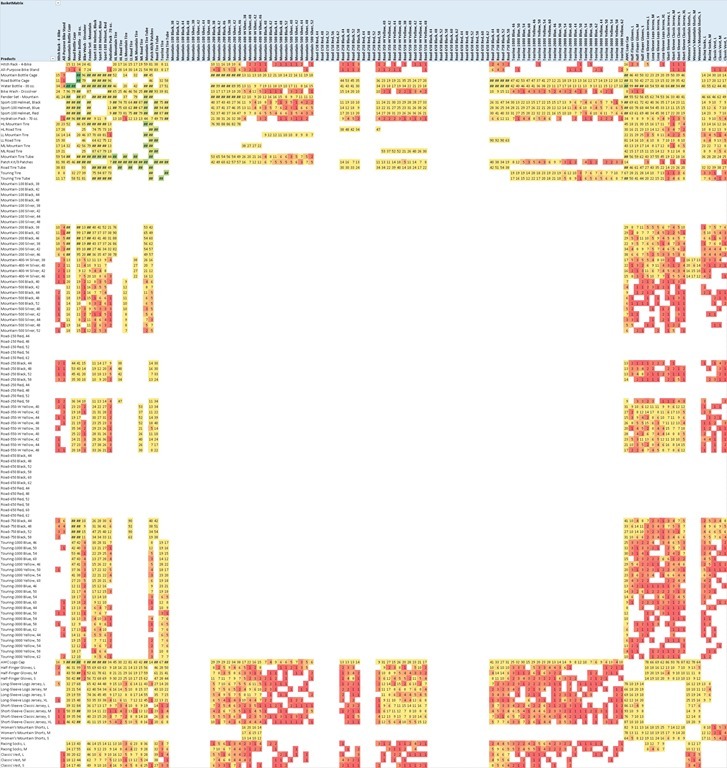 If I utilize a ‘Product Category’ and ‘Model’ slicer for my ‘Filtered_Products’ table to manipulate the data, that is when I run into the worst performance issues. however, these are not directly related to the formula itself but more the the MDX that the Pivot Table/Excel creates and how this is processed in Power Pivot. Hi I am trying to solve a similar problem, but with no success so far. I have a table with 3 columns([date],[market],[return]) now I want to calculate the correlation coefficient like they do here http://bitwizards.com/blog/november-2012/correlation-coefficient-dax-formula . Could you help me? If you want I can provide you a sheet with sample data. Thank you for the post; it is very helpful. Other programs like R are able to conduct MBA’s while analyzing predicted sales based on combinations of n products (i.e. product d is most often purchased with products a, c, and f). R is great, but not very user-friendly in end-user application. Can DAX accomplish similar iterations for MBA? Thanks! so you want to select 1-n products and see which other products are most oft purchased together with them? 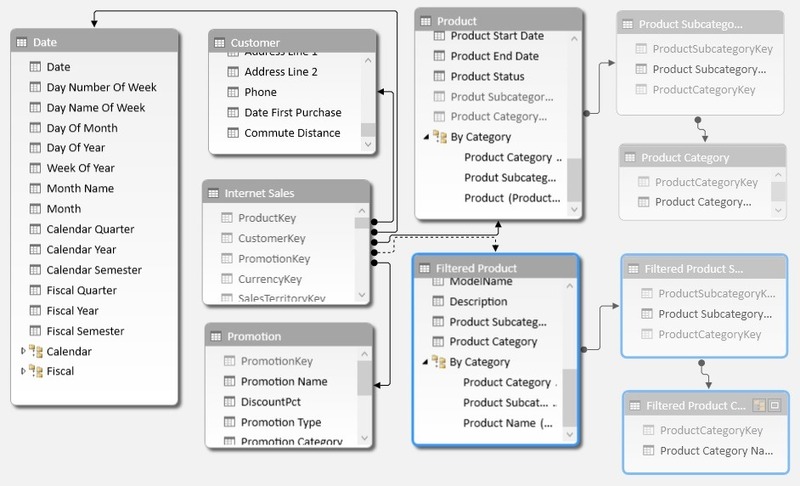 the formula actually also works for multi-select on the Product dimension. you could probably also convert the names of the Top 3 resulting products into a separate measure if thats what you want? Total amount of bundled products. Sold to same Sales Amount ? the selected product very likely has been placed in multiple baskets/bought by multiple customers – which total amount would you like to calculate and for which customers/baskets? can you also elaborate on “Sold to same “Sales Amount””? Customers with Both Products> 900 $ ? your post is really very cool and well explained. I just have a question regarding the 3rd question (customer has not bought…). What is meant by the expression [Sum SA]? Is it a measure? 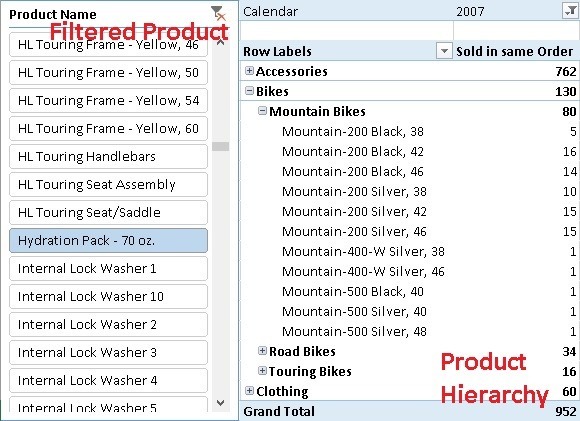 If I’d select 1 product from ‘Product’ and 2 product from ‘FilterProduct’ is it possible to see value where all 3 products are in the same order? Thanks for the post. Was extremely easy to follow. I was interested in showing summary results. I created a post on Stack Overflow and thought I’d reach out see if you had any thoughts on how to expand on your work. Thanks for your post. It was super easy to follow and very helpful! I posted a question expanding on your work and thought I’d reach out to get your thoughts. I will reply directly on StackOverflow/MSDN once I have a solution. Should definitely be doable!